Group Affiliation: Cult of the Crimson Flame, Villainy, Inc.
Zara is an expert in chemistry, a highly accomplished leader and a skilled swordswoman. Flame Capsules: Zara's most commonly-used invention is a capsule that uses hydrogen to create fire which can be seen but not felt, and vanish without trace. These are often combined with invisible ink to create "phantom" messages meant to intimidate the Cult's enemies. Flame Fetters: Zara designed shackles that self-destruct if forced, burning off the captive's hands and/or feet. Sun Reflectors: Zara designed mirrors that were installed on the Cult's central temple in the Arabian Desert to dazzle and confuse unwanted strangers. Scimitar: In close combat, Zara's preferred weapon is a scimitar with a burning blade. This sword doubled as an initiation prop for the Cult; prospective members were expected to swear on it that they would kill even their own kin. The self-proclaimed Priestess of the Crimson Flame. Her true past is unknown; however, she claimed to be "an Arab girl", (although she had a French accent), and wore belly dancer attire. According to her tales, she was sold into slavery as a child; which created in her an intense hatred of mankind. 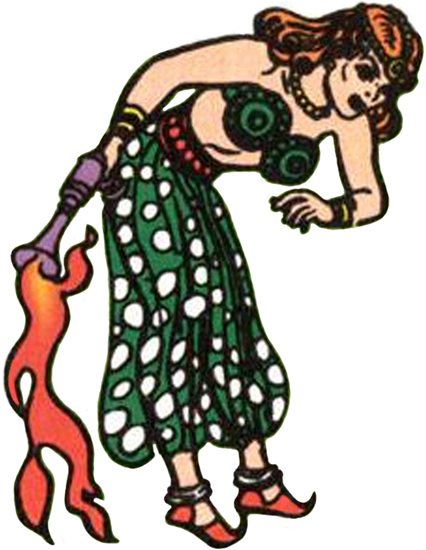 Using a flair for pyrotechnics, she eventually created a new religion called the Cult of The Crimson Flame. Zara rigged various fire-based effects to dazzle her followers and keep them in thrall to her.